You, and not my craze with conquest, are my wedding. for self-defense in the land of my Andalus. Casket, brass with inlaid gold and silver, Iran. Silk with Arabic inscription, silk and metal-wrapped thread in lampas weave, Spain. In the Islamic world calligraphy has been taken far beyond pen and paper it has been explored into all art forms and materials. 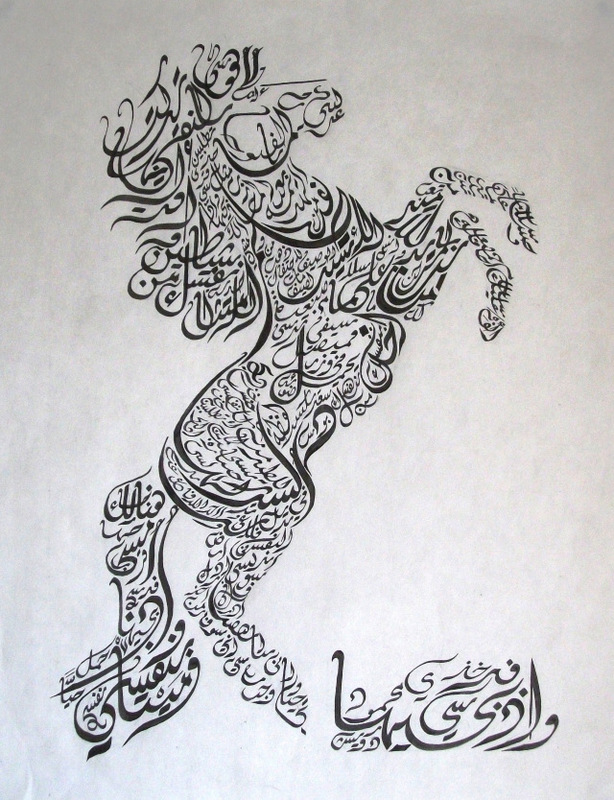 Nowadays calligraphy may be counted as a uniquely original feature of Islamic art. The genius of Islamic calligraphy lies not only in the endless creativity and versatility, but also in the balance struck by calligraphers between transmitting a text and expressing its meaning through a formal aesthetic code. The Arabic language, and subsequently the art of calligraphy, is held in great esteem by Muslims because Arabic was the language in which the Qu’ran was revealed to the Prophet Muhammad in the 7th century. The Arabic text of the Qu’ran is sacred to Muslims, and its high status gave rise to an associated respect for books in general. However, it is important to remember that while the Qu’ran’s holy status provides an explanation for calligraphy’s importance, by no means all Arabic calligraphy is religious in content. In general, calligraphic inscriptions on works of art comprise one or more of the following types of text such as: Qu’ranic quotations, other religious texts, poems, praise for rulers and aphorisms. These types of texts can be explored and seen through all types of art forms ranging from historical Islamic calligraphy to the present interpretation of calligraphy. Ink on parchment-Before the invention of paper, vellum or parchment was the highest quality writing material available. It was made from prepared animal hide. A reed pen, with the tip cut at an angle and filled with ink, would have been used. Writing on vellum can be erased or altered. Ink on paper-calligraphy would often be created using a reed pen and ink directly onto starched and polished paper, which provides an excellent smooth surface for writing. Ceramics-The calligraphy tile pictured above was deeply carved with the inscriptions (and plant designs) and covered with coloured glazes, before the final firing. This technique was used in Central Asia only for a brief period, from around 1350 to the early 1600s. Wood- letters are often carved with sharp metal tool and later painted. Textiles- often written with ink on finer materials such as fine silks and satin the picture above with Arabic in scripted calligraphy states ‘Glory to our lord the sultan’. Enamelled glass-The above image of the lamp was made by blowing hot glass into shape and then leaving it to cool. The enamel colours and gilding were then painted on – the enamel was a solution of colours and ground glass that melted and fused on to the lamp when it was reheated in a kiln. The blown glass would have been decorated with enamel and gilt, possibly using fine brushes. Metalwork-the casket pictured above was chiselled out taking out areas of brass surface then filled with pieces of silver and gold. They added details by chasing the surfaces of the softer inlaid metals with a hammer and tools and adding a black filler to create contrast.